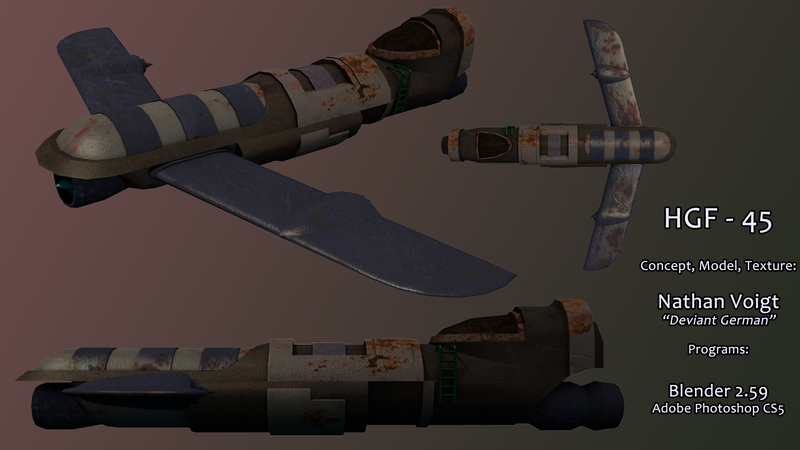 Texturing has finally commenced on this project. I know I'm running beyond the scope of the challenge, but as the final challenge (and the fact that I've had a few hiccups during unwrapping and texturing) I'm going to be lenient on myself just this once. When the 4-week challenges kick off they will be far too structured for me to allow myself such things. Anyways, I've had some difficulty with texturing and such on this one but I'm starting to come up with some ideas that I like. Hopefully I will have this one done soon so we can all move on. Here is the concept for the new ship. It is based loosely on the design of classic Corvette's. I feel much more inspiration with this design than I did the last. Hey guys. I know updates have been slow as things go and I have a valid reason. Mid-terms were a bit heavier than I thought they would be and essentially took all my time away from this challenge. As well, the more I worked on the final concept the more I came to hate it and become dis-interested with it. As most artists know trying to work on something you don't like or don't care about becomes a horrible chore and usually gets left in the dust. As such, I've decided to abandon the final concept and move on. This doesn't mean I'll be going onto a new challenge just yet but instead am drawing up a new concept for a proper FINAL model. After it is completed, within the same confines of a week, I will be taking a 1 week break as I prepare for the new and improve 4-week challenge format. It will be at this time that I'll be turning to all of you for a new theme. Updates should return to normal from here on out for this final week so I hope you all keep an eye out for the new model. I will have the concept uploaded as soon as it is finished and hope to begin modeling tonight. I'm looking forward to this final model as the inspiration comes from one of my favorite classic cars. Welcome everyone to my challenge thread. For those of you just joining this thread I have some updates. After the first initial week of the challenge I learned a few things not only about modeling but how to more appropriately organize this thing. I have decided that keeping track of the months is useless considering how uneven they are. It would be impossible for me to deal with modeling within a short week so I've decided upon a new structure. Every 4 weeks will be a new challenge theme after this initial challenge is completed by the end of this one. For each 4 week challenge I will be posting a new thread to help keep things organized. As well, my working week will start on Saturday's and the deadline for that week will be midnight the following Friday. If you want to keep track of this thread feel free to Watch and if you want to keep track of everything I have in store for the community especially feel free to Friend me. Below is all content at it's current state. This is the final result of the 1st week of the August challenge. All work is my sole property and any use of the materials contained within this thread without my consent will be dealt with accordingly. Click on the picture for the full resolution render. Here is the final result of week 2 of the August challenge. Admittedly not too happy with the final outcome on this one. However, this challenge is not always about representing my best work but about challenging myself to become better, in quality, deadlines, working outside my comfort zone and accepting failure. I have learned through this week how I need to better schedule my time to benefit the challenge and produce a better model as well as set deadlines for myself on when particular aspects need to be finished. btw your spacecraft looks like a gun lol. "Mapping is like a book, a map should tell a story without the need to explain anything to the player, instead it should immerse the player into a virtual world and let their imagination do the rest"
Yep, 2 of my 3 concepts for this month were based on spaceships modeled after firearms. I found it to be intriguing turning something normal into something different. Not something that's really a modeling challenge, more of a texturing challenge, and I've done a few of those in the past. It's quite easy really once you know how to setup all the layers. Final update for the night posted. Got some decent work done in 1 day considering working on school work and other things throughout the day. Tomorrow is another day, and hopefully equally as productive. New render posted. Detailing is coming along nicely. Still a few spots I'm unsure of what to do with but close to finishing the modeling on this one. Looking forward to texturing. Haha, well lucky for your the deadline is the end of the month before a new topic is chosen, and unless you decide to you're not confined to doing 1 new model every week. i think its a bit edgy?! neahc wrote: i think its a bit edgy?! Edgy good or edgy bad? If bad, what are the problems? Crits are more than welcome here, that's how we, as artists, evolve and get better. Holy crap your shotgun spaceship looks awesome! 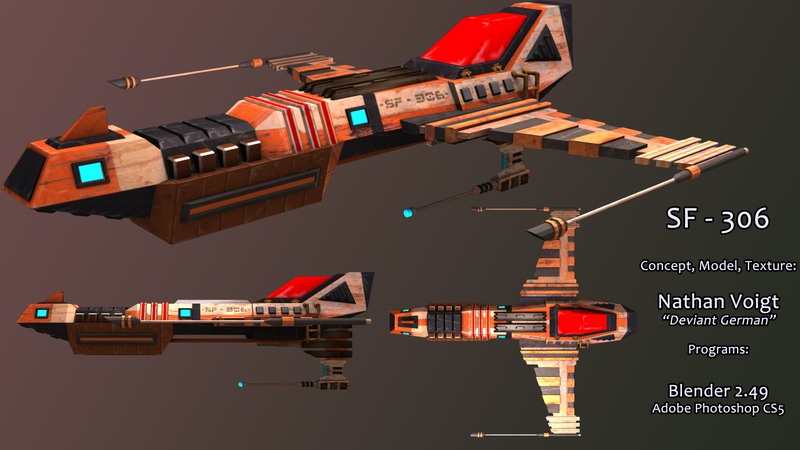 Joe_Shmoe wrote: Holy crap your shotgun spaceship looks awesome! Thanks dude, I can't wait to start texturing. I'm having some kind of weird issue with unwrapping the main body though. The bottom half of the back end doesn't want to unwrap at all for some reason so I gotta figure that out first. Yeah, I figured it out, bad seams were the problem. My seams didn't connect all the way around an edge, so the part that wasn't unwrapped was unwrapped, it was just interpolated into a small cluster of uv-verts attached to the unwrap of the main portion of the body that got squished when I was fixing the distortion. Fixed it, now I just have to adjust all those UV's and re-organize the map a bit. It's always the simple things. I'm just about finished unwrapping the main body. I went back and started over with the unwrapping. The normal unwrap function based on seams, no matter how well placed, did not give desirable results with a test grid, so I painstakingly place the majority of the uv's by hand using "project from view" and interpolating between two edges when I needed to with the regular unwrap. 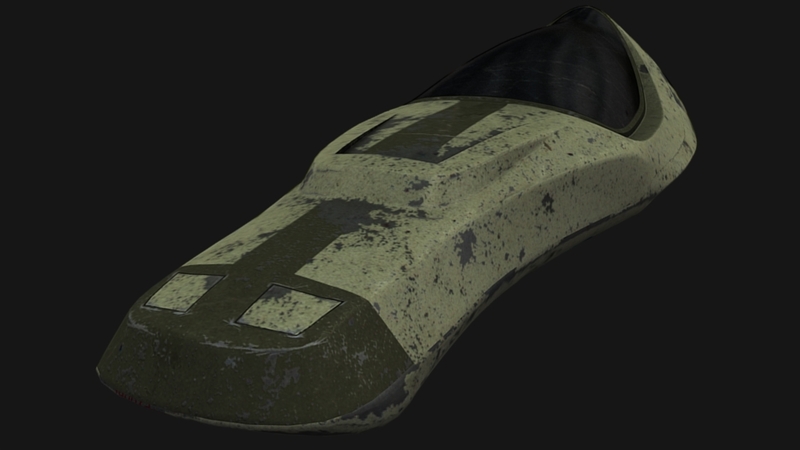 It was time consuming but I much prefer the result and it will make texturing far easier. Another learning experience for me as I've never given much time to ensuring a good UV unwrap and just dealing with a sloppy one. It'll be interesting to see how much more logically and easily I can attack next week's model with the few things I've learned on this one. I watched this anime a while back, in english though, and that satellite was cool! Doesn't have to be a fighter, the theme is just the general term "space ship". So really any man-made space ready maneuverable object, and satellite's can fall under that. Like if the Slave 1 had a full wing and flew horizontal rather than upright. Haha, yeah, I totally see that in the designs completion at the moment. The lower part of the ship design definitely will change that comparison but it is something I hadn't even noticed. Perhaps that's where my subconscious got the idea though. Thanks for the comment. Clean wireframe and model good job! Sarge127 wrote: Clean wireframe and model good job! Thank you kindly sir. I have quite enjoyed this weeks model so far. I unfortunately had converted my sub-surfed model from a modifier to actual mesh information without a way to go back by the time I realized it, so as far as the visuality of the rendered wireframe goes for presentation sakes I wish it was better. I have done my best however to maintain the cleanest lines, loops and overall topology flow that I can, especially considering that I am still fairly week with hard-surface models in comparison to organic models. Thanks again for taking the time to check this out.